Educators who teach Holocaust history face the same challenge every year: how to get students interested in one of history’s greatest tragedies more than 65 years removed from World War II. In the old days, the formula was straightforward. In recent years, however, some educators have shifted their approach toward teaching individual stories. “You use the family pictures and focus on the family experience before the war, during the war, and after the war,” Sasportas said. Among others, this approach is being championed and supported by the Vienna-based nonprofit organization Centropa, which has amassed a collection of more than 22,000 digitized photos and 1,300 oral histories on Jewish life in Europe before World War II and beyond. The material reveals the intimacy of the lives of Jews across Eastern Europe and the Balkans, and how those lives were extinguished. Beyond the technology, the key to the approach is to teach about Jewish lives before World War II, not just their experiences in the concentration camps. They went to synagogue, married, played sports, and were active in civic associations and government; it’s all documented in photographs and interviews. Centropa’s material, including exhibitions and lesson plans, is available at no cost to teachers. Earlier this month, Centropa organized a nine-day seminar for educators that focused on how teaching the Holocaust is changing. 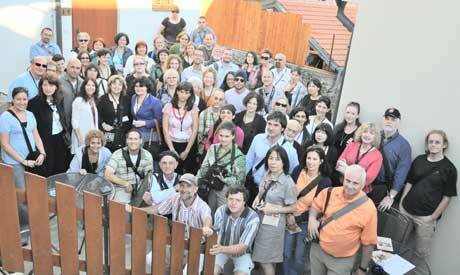 Seventy-five teachers from 12 countries visited Prague, Budapest, and Vienna. They toured Jewish neighborhoods, hobnobbed with government ministers, and met luminaries of Jewish institutions, but the program’s core was about how to teach the Holocaust. Another high point of the trip for Holton was his first deep interaction with a survivor, Hannah Fischer, whom he sat next to at lunch here. Fischer, a retired child psychologist who fled to England before the Holocaust, studied with Anna Freud, Sigmund Freud’s daughter, and returned to live in Central Europe. “Personalizing the Holocaust through a woman like that will not only change my life, it will change the intensity with which I teach the Holocaust and the way I guide others to teach it,” Holton said. Holton teaches the Holocaust from the viewpoint of both victims and perpetrators. Some students resist the approach at first, Holton said, but eventually they are keen to study those who murdered Jews or stood by as they were sent away. Using Centropa materials, some of Holton’s students make films with computer technology that include the “perpetrator” perspective. Among the most valuable aspects of the Centropa material, teachers said, is that students from around the world can collaborate and share their materials online.